November 7, 2018 | Filed under: Current Articles,Featured | Posted by: Alex A. Six years ago, when news spread that the Reichert Celebration would no longer hold its slot class, a dedicated group of horsemen jumped into problem-solving mode. They recognized the void that the class’s absence would leave in the industry, particularly for stallion owners and breeders. They sought an elite spotlight that would shine on the industry’s best stallions, promoting modern Western Pleasure riding and quality bloodlines. The Western Pleasure Super Sires program was born, and it will be celebrating its seventh year of existence with more exciting growth in 2019. As we ring in the New Year, WPSS will implement exciting new changes to the program that is sure to have far-reaching effects on the horse industry. Executive Committee member Joan Schroeder remembers the program’s inception. “Originally, the program was just an idea that a few of us had kicked around at the Congress. With my experience in various disciplines, I was able to reflect on what was available for breeders outside of the Western Pleasure industry. 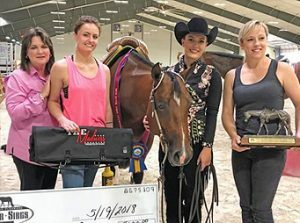 In Reining, we have the National Reining Breeders Classic and the Cutting horses have something similar, so I was privy to the idea of promoting quality within a discipline. That’s how WPSS happened. The whole program stemmed from a group of horsemen looking out for the good of the industry and trying to come up with a solution to a problem,” Schroeder recalls. The original group consisted of 20 horsemen, each of whom fronted $5,000 to purchase a slot for their stallions in the program. They hoped to create an event that would make it beneficial for Non-Pro exhibitors to show the stallions’ offspring. The horsemen agreed that all money collected would be doled out as awards to winners. This would allow the Non-Pros to keep pursuing their passion while the stallion owners shouldered the expense. Since then, WPSS has seen nothing but success, having awarded more than $380,000 to Non-Pro exhibitors. Originally, only two classes were offered: NonPro Limited and Non-Pro Three-Year-Old Western Pleasure. In 2013, its first year, WPSS awarded $80,000 to the winners of those classes. However, the program has since expanded to include classes like 4- & 5-Year-Old Non-Pro Trail (added in 2018) and the Non-Pro Open Longe Line (added in 2017), both of which award $5,000 to the class winners. Other classes award a $10,000 check. One change to look forward to in 2019 is the addition of more new classes including an Open 3-Year-Old Western Pleasure class and an entirely new English division for stallions. This new division will bring Hunter Under Saddle and Hunt Seat Longe Line classes into the mix. Other changes for 2019 include a $1,000 reduction in stallion nomination fees and the sale of breedings – discounted at fifty percent – in the program. The funds from the stallion breeding fees will be added to the purses. Perhaps, most importantly, the program will now open stallion eligibility to all horses, regardless of their earning level. Prior to 2019, only stallions that had earnings below $300,000 were eligible as Super Sires, giving the program a decidedly younger cast. It was a rule implemented to protect young sires so that famous, high-earning stallions wouldn’t come into the program and monopolize it. Joan says, “After laying a solid foundation for our program with a base group of stallion owners, and horsemen and horsewomen, we felt this was the perfect time to open the doors to other stallions and their owners. Opening up the program helps it make more money and allows us to add more classes to encourage healthy growth in the show horse industry as a whole, which is such a passion for us as stud owners.” The group’s integrity, meticulous approach to rule and bylaw creation, and honest and genuine aspirations to build something good for the industry are heralded by executive committee members, not only as pillars of the program, but qualities that set it apart from other programs that have fallen by the wayside over time.